During the service, the Vocal Chamber Ensemble provides a song of reflection. For many Catholics, Easter is one of the most joyous celebrations of the liturgical year. However, it is easy to forget that the Easter season is much longer than just a weekend. As Catholics, we are challenged to experience the Resurrection and Jesus’ love in new ways over the course of these fifty days. Recently, the student body of Chaminade was called in a special way to remember the true meaning Easter plays in their lives at the Easter prayer service on Friday, May 12. 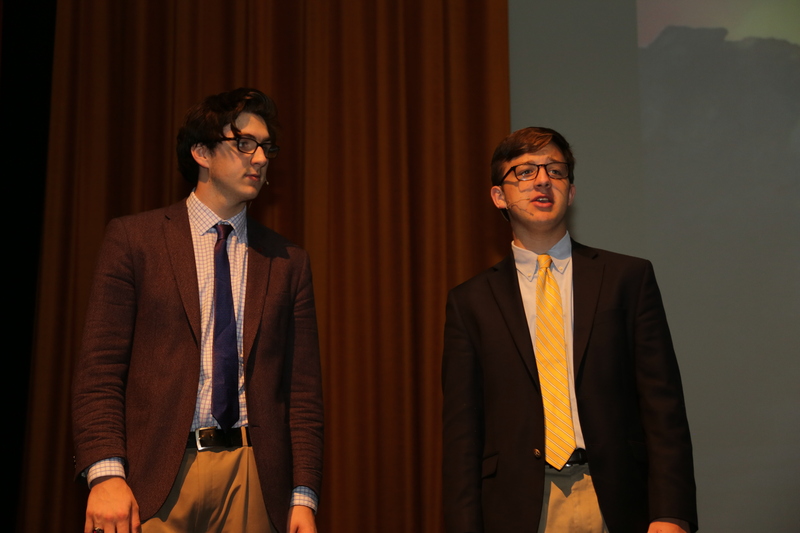 Andrew Weiss ’18 and Chris Devlin ’19 offered reflections for the video selections during the service. As the prayer service began, students viewed a video portraying the ministry and passion of Jesus through social media posts. This video encouraged students to reflect on their own uses of social media, and whether they always demonstrate their belief in Jesus. The students were also shown “Evidence,” a video by Outside Da Box Productions, which offered a more modern interpretation of the gift of the Resurrection. It explained that even seemingly empty gifts, like the tomb on Easter, are sometimes the greatest gifts and can deeply change us. In a final video, the students watched a mock trial that questioned whether or not a girl truly lives her faith. The story quickly became relatable to the students as the question was raised if they act out the teachings of Jesus. After watching the videos, the students were given time to reflect on their profound themes as the Glee Club performed a reflection song. The students also prayed together and received a special prayer card to aid in their reflection. “I felt spiritually rejuvenated after the prayer service,” Kristijan Barnjak ‘19 explained after the service. The Easter prayer service was an opportunity for Chaminade students to experience the joys of Easter in a new and more meaningful way. As the end of the Easter season approaches, this service offered students an important reminder to hold onto these joys, so that they can continue to truly live out their faith in all aspects of their lives, long after the end of these fifty days. Posted in News and tagged easter, prayer service. Bookmark the permalink.